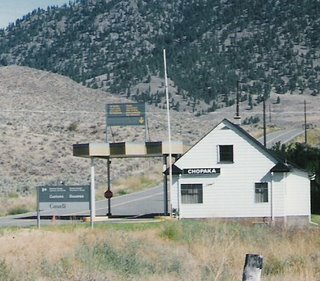 On my 1995 bike trip to Northeastern Washington State, I came back through part of Canada. Entered Canada at this lonely customs house in the west part of the Okanogan Country. This isn't even the Okanogan's main "Highway 97" crossing. It is along a road between Nighthawk, WA. and the Chopaka area of BC. The pressure strip made a "ding." The agent looked up from his book, or maybe woke up from a nap, when I arrived. Like an old filling station. Yes, Canada is a big country with lots of open space and they are trying to keep it that way. I get a few questions while crossing the border. These questions are mostly aimed at making sure I have plans to come back home to USA. They like to know that my job is waiting for me when I get back. "Thanks for reminding me folks, I thought I was on vacation." They say, "Go on through" as they ascertain that I am just planning to visit, not stay. This remote crossing is different than the multi-lane crossing at Peace Arch. That is along I-5 which is just about becoming one city all the way from Olympia, WA. to Vancouver, BC. A city with some gaps in between. Bellingham is just another wisp in that "I-5 corridor swirl" which has been called Pugetopilis before. As I peddle my bike in this "close to the border" area, many thoughts come to mind, including the subjects in yesterday's post.